On September 25, 2017, the University of Wisconsin-Milwaukee publicly launched the largest fundraising campaign in our university’s history. This $200 million fundraising campaign will strengthen the campus in three critical areas: student success, research excellence and community engagement. Contributions made by faculty and staff like you are critical to our success. Gifts to scholarships and fellowships allow us to increase the enrollment of talented students; continue the kind of research that earned UWM recognition as one of the nation’s top 115 research universities; and further demonstrate our commitment to engaging the community. 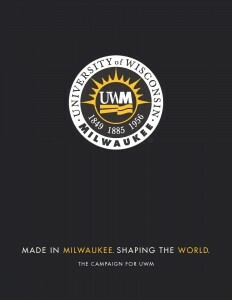 For Milwaukee to be a great city, it needs a great university. 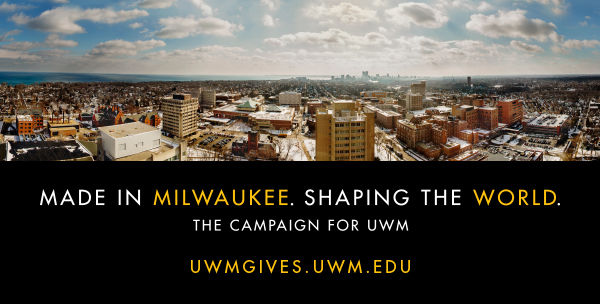 Please support the UWM Gives to UWM campaign. To set up a payroll deduction, fill out the UWM Gives to UWM Payroll Deduction Form. To give by mail, fill out and return the UWM Gives to UWM form.